March was an active month for Gwyneth’s Gift Foundation. We began the month training 14 of Monarch Pool Care’s staff in Hands-Only CPR and how to use an AED. 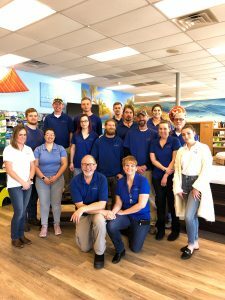 We were happy Len, the co-owner of Monarch Pool Care, reached out to us to train his staff after attending a previous training event of ours at St. William of York. We more than quadrupled our March training numbers at our annual Stafford Soccer Training where we trained 79 coaches, and others, in Hands-Only CPR and how to use an AED. Each year we make it a priority to share these skills with Stafford Soccer coaches and are thankful that Stafford Hospital allows us to host these important training events. With our Stafford Hospital Foundation Community Benefit Fund grant, we can spread the knowledge of Hands-Only CPR by giving out CPR Anytime kits to coaches which will allow them to share the same life-saving skills they learned from Gwyneth’s Gift Foundation with their team, family members and peers. Gwyneth’s Gift joined our neighbors at the Disability Resource Center later in the month to train 16 of their staff and wrapped up the month training 14 community members at the Heart Health and Wellness Fair. We ended March with a total of 123 individuals trained in Hands-Only CPR and how to use an AED! 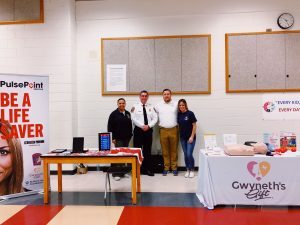 Along with the numerous training events we held this March, we also attended the Health and Wellness Fair at the University of Mary Washington where we shared Gwyneth’s Gift’s Mission and the importance of CPR with the public. Through our Awareness Program, it is our goal to educate the community about the importance of CPR and encourage them to take the next step in learning the skills to help save a life. 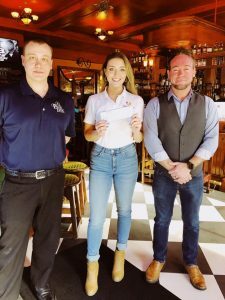 Big shout out to Park Lane Tavern for co-hosting a fundraiser with us and for going above and beyond our expectations. With their help, we were able to raise over 500 dollars for our Foundation Programs! Thank you, Park Lane Tavern and your staff, for your support. What a month March was! Gwyneth’s Gift has a lot in store for April including a public training event at Highmark Brewery and a partnered event with Castiglia’s Sky Bar! Visit our events page, mark your calendars and get involved this month. And don’t forget to like us on Facebook! We look forward to another month of creating a community of life-savers!